Oops - we don't appear to have a video for the GT-2500N. Thank you for your email. Well scanner is working perfectly fine and I found it very useful for our day to day tasks. Especially all scanned files in to one main file and in pdf format; I think is a very useful function. Speed of scanning for Black & White Images is excellent and found same as described in product specification but Coloured Image scanning is really very very slow. Bringing high speed scanning to multiple users, the Epson GT-2500N scans at 27ppm mono and 11ppm. Networking allows this scanner to become a cost-effective and space-efficient shared resource. 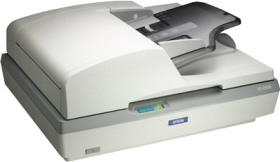 Reliable and robust, it produces high quality scans fast and efficiently with the help of its 50 page Automatic Document Feeder and duplex scanning facility. Automatic duplex functionality reduces manual intervention by scanning both sides in a single process. It significantly reduces the time taken to scan documents. Achieve professional results when you scan printed documents such as magazines and newspapers with the Descreening Filter and remove unwanted background shadows with Automatic Document Enhancement (ADE) technologies. Integrate quickly and easily into any document management system thanks to the TWAIN and ISIS® drivers provided as standard. The Epson GT-2500 has passed extensive compatibility testing with independent software vendors including ABBY, Acusoft, EMC, Gravic, Kofax VRS, Matrix and Nuance.